Northern California, Idaho and Montana Guided Fly Fishing Trips and Instruction. Whitney Gould guides for Headhunters Fly Shop, please see outfitters details below, after guiding at Alaska West, where she was an integral part of a guide staff that pioneered spey fishing for King Salmon. Whitney is a 6 time Spey-O-Rama world casting champ, and considered one of the worlds best two-handed casters. In the autumn, Whitney heads to California’s Klamath to guide/teach spey casting while pursuing fall run Steelhead, followed by a winter guiding Steelhead anglers on California’s North Coast. She is an OUPV Captain, an Ambassador for Gary Anderson Custom Rods, Simms Flyfishing Products and RIO Products. Jefferson Spey Sessions 2019 – Klamath River Whitney Gould, Jason Hartwick and Rich Zellman are stoked to offer the spey schools again this year. Come join us to be engaged in all things spey/all things steelhead for three days of on the water instruction. We designed the Jefferson Spey Sessions to target sink-tip and floating line spey cast fundamentals, both for those who are developing new skills and those who want to continue to evolve and refine what they already know. No spey casting experience required! “The school format was cool. It seemed like you put a lot of effort into making it work smoothly, and much thanks to you, and please pass on to Whitney, and Jason. It was very nice to relax at the property and have everything taken care of. Missouri River Trout Trips: Trout Spey and/traditional trout trips. 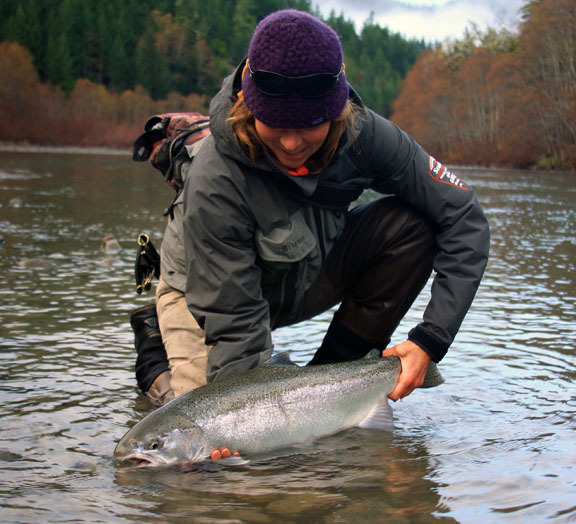 Northern California SteelHead Trips: Winter SteelHead trips; Contact Info: 503-313-7124 or whitneygouldspey@gmail.com.